High up on the Helshoogte Mountain Pass (linking Stellenbosch to Franschhoek,) exists a wine enthusiast, diamond lover, foodie and art fanatics dream. Delaire Graff Estate has made the impossible possible, it has fused all the world’s finest treasures into an eloquently opulent experience just waiting for you to visit. This is all due to the visionary owner of the estate. Laurence Graff began his journey when he founded Graff Diamonds in 1960, a pinnacle store in the international diamond industry. Today he is not only a world-leader in this field but the owner of Delaire Graff, an avid art collector and philanthropist. Once inside you need to decide between wonderful wine tasting, a delicious culinary extravaganza, a shopping spree at Capri or the most dangerous of all, a visit into the Graff diamond store! Our recommendation – all of the above of course! Wandering through the delicious wines is a great place to start. Take a seat under the leafy tress and let the music from the grande piano waft over you while sampling tantalizing tasting menu. Make sure you don’t leave without tasting the flagship Cabernet Franc, the estate’s best seller. Since 2008 the Delaire Graff Cellar, one of the most advanced cellars in the region has been making world-class wines. Once appropriately merry… wander up the ramp to the Delaire Restaurant and buckle in as the team of gifted chefs and sommeliers take you on a culinary joyride. Savour the food as each plate is served with the utmost care and teeming with fresh ingredients, picked daily from the farms very own vegetable garden. The Slow Cooked Beef Short Rib will render you speechless especially when followed by the Coconut Namelaka, worth every calorie and much more! As if this is not enough Delaire Estate boasts a second restaurant, Indochine which sits with the lodges at the crest of the estate. Inside a wave of blue and copper washes over you and equips you with the ultimate appreciation of the green gardens and winery beyond the wrap around balcony. 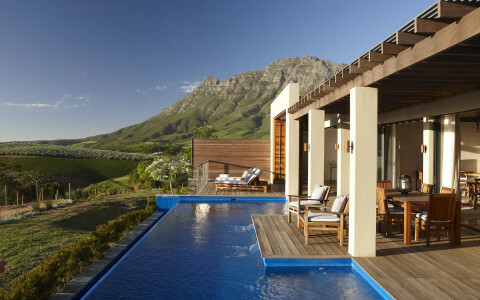 The exquisite view extends all the way back to dignified Table Mountain. Relax under the intricate “Swallows in Flight” by Lionel Smith, accompanied by your very own Bonsai Tree and relish each vivacious dish. We recommend the Tamarind Springbok. Once utterly satisfied head home to a deluxe lodge and perhaps have a midnight dip in your heated infinity pool before unwinding into the elegant sanctuary. Large open spaces, enormous windows, high ceilings and neutral colours combined result in a soothing and peaceful embrace. Here you literally have your very own piece of heaven and can survey the lands below and beyond. Perhaps order a bottle of Sunrise Brut MCC and some canapés, and appreciate the splendour of the African sunset from your very own sundeck. Even better take a hike up to “Leopards Landing” the estates top-secret picnic spot and have the chef spoil you to your very own basket of treats. At Delaire they literally have thought of everything. Fulfil that need to exercise at the fully equipped Technogym or that need to spoil yourself or your loved one with a visit to the spa. With four elegant suites the holistic spa will take you in and treat you to only the very best that your heart desires. 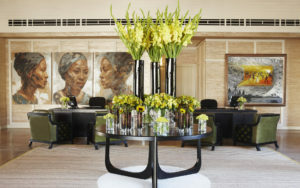 One cannot ignore the exquisite contemporary art collection scattered around the estate. There are too many to mention but our favourites are the Dylan Lewis Cheetah Sculpture which welcomes you majestically to the estate, the eclectic Deborah Bell Sculptures and a new meaningful addition at the entrance “The Passbook Must Burn” by William Thomas. Only 5 minutes from charming Stellenbosch and less than an hour from Cape Town International airport sits this treasured citadel. Home to some of South Africa’s finest wine, food, hospitality, art and nature it is a sight to be savoured by all. Contact Iconic Africa now for this and so much more! At our exclusive rates we can complete your African getaway with an awe-inspiring safari or a luminous stay in the heart of Cape Town. High up on the Helshoogte Mountain Pass. Mind-blasting views of the Franschhoek valley. Aall the world’s finest treasures into an eloquently opulent experience. The Cape summers are like something out of a movie! They are warm and dry, beginning in November and lasting until February. The warmest months are January and February, which are by far the best months if you are looking to spend some time on the beach as well as in the winelands! If you seek unbridled luxury then look no further than Delaire Graff. Simply contact one of our African travel experts and let us begin to tailor make your journey to Africa!